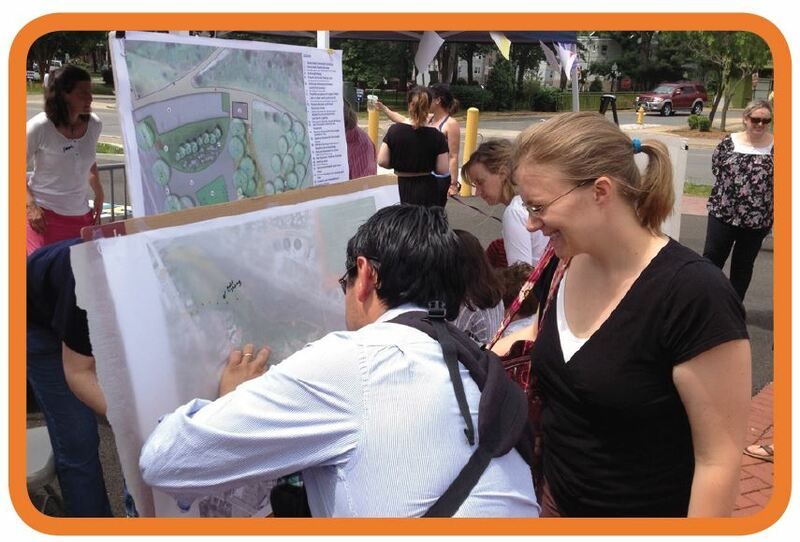 From May through June, the City of Alexandria Park Planning staff sought feedback on the draft Park Improvement Plans for Four Mile Run Park and other large City parks and held “mobile workshops” at Alexandria’s farmers markets and community businesses and institutions. 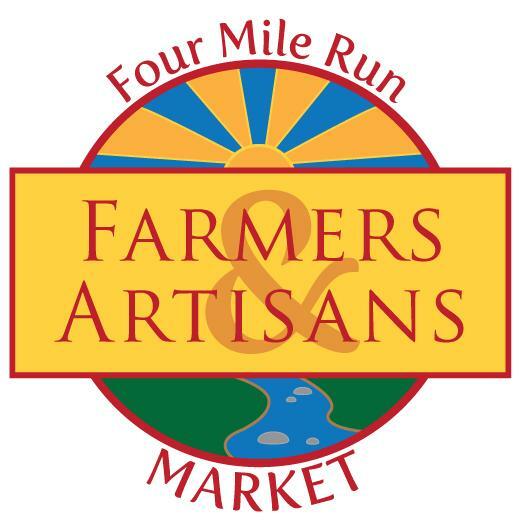 Throughout the rest of summer the Park staff will be finalizing the Four Mile Run Park Improvement Plan prior to going before the Park and Recreation Commission and City Council this Fall. 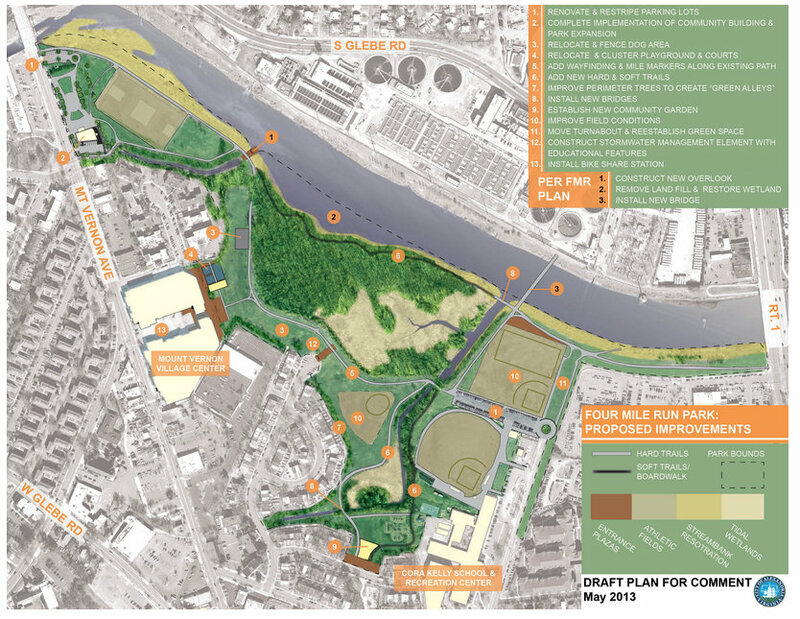 The first draft of the long range plan for Four Mile Run Park was released for public review and feedback in May. The majority of survey and workshop participants expressed excitement for a fenced dog park at Four Mile Run Park. Participants noted how the fenced dog park would be a great place for nearby dog owners to meet each other. The dog park’s year-round use would increase the sense of safety at Four Mile Run Park. There was also a general consensus that the dog park should be located close to parking but away from the playground. Participants stated that the proposed dog park could be made better with additional shade, suitable surfaces, and adequate amenities. 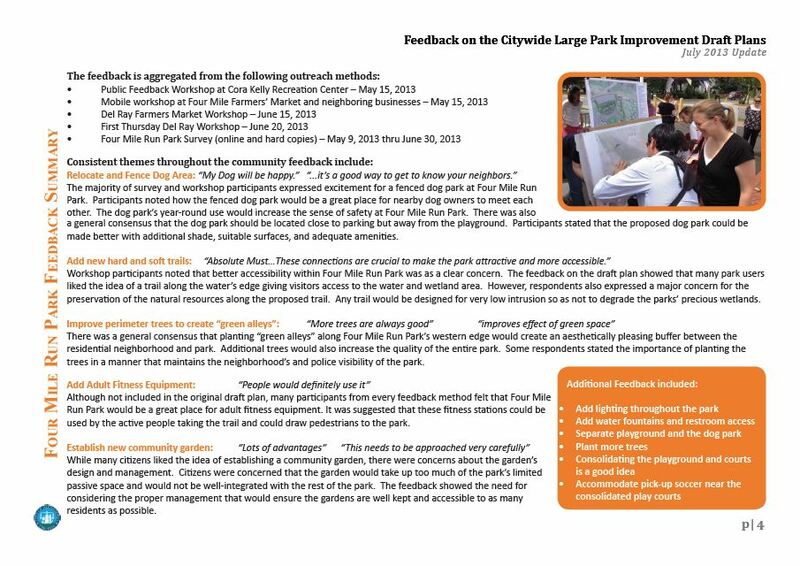 Workshop participants noted that better accessibility within Four Mile Run Park was as a clear concern. The feedback on the draft plan showed that many park users liked the idea of a trail along the water’s edge giving visitors access to the water and wetland area. However, respondents also expressed a major concern for the preservation of the natural resources along the proposed trail. Any trail would be designed for very low intrusion so as not to degrade the parks’ precious wetlands. There was a general consensus that planting “green alleys” along Four Mile Run Park’s western edge would create an aesthetically pleasing buffer between the residential neighborhood and park. Additional trees would also increase the quality of the entire park. Some respondents stated the importance of planting the trees in a manner that maintains the neighborhood’s and police visibility of the park. Although not included in the original draft plan, many participants from every feedback method felt that Four Mile Run Park would be a great place for adult fitness equipment. It was suggested that these fitness stations could be used by the active people taking the trail and could draw pedestrians to the park. While many citizens liked the idea of establishing a community garden, there were concerns about the garden’s design and management. Citizens were concerned that the garden would take up too much of the park’s limited passive space and would not be well-integrated with the rest of the park. The feedback showed the need for considering the proper management that would ensure the gardens are well kept and accessible to as many residents as possible. Alexandria's Department of Recreation, Parks and Cultural Activities began this multi-year process last year to develop a Citywide Large Park Improvement Plan, the goal of which was to review the existing conditions and future needs for Alexandria’s large, city-owned, multi-use parks. Along with Four Mile Run Park, the other parks studied include: Simpson Stadium Park, Chinquapin Park, Henlsey Park, Holmes Run Park, and Ben Brenman/Boothe Parks (click on each to go straight to the draft plans). The full Four Mile Run Park Draft Plan is available online, here. 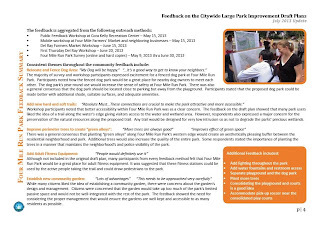 Through the Citywide Large Park Improvement Plan, the park staff intends to determine budgeting priorities and recommendations for both short and long term incremental improvements. Contact Dana.Wedeles@alexandriava.gov or 703.746.5491 with questions or concerns.